Lova: So that’s it. Afterwards, when I was staying with the rabbi, I met Khayim Rapoport, another one of my father’s relatives, who lived in Kfar Saba. He told me to come work in the orchards in Kfar Saba. I was happy to go there, only in the meanwhile, I noticed how much they needed water in Israel, that it was very important, so I went back to Haifa. 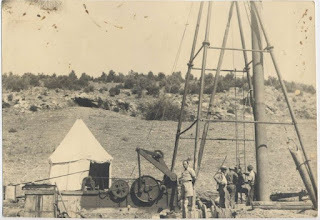 I decided to work drilling wells, and that’s what I ended up doing, for forty-one years. I worked drilling wells and eventually became the manager of the drilling department with heavy machinery, in the company “Mekoroth”. Until I retired. Lova Rabinovitch in the film Awodah (1935), one of the very early Zionist films, produced by Paul Boroschek and directed by Helmar Larski - the film was partially inspired by Lova's adventures told here. The first job that I did was a water pump for the well in Kiryat Khayim, even before Kiryat Khayim existed. The whole place was nothing but sand dunes. There was no road to get there, so I drove from Haifa to the railway workshops. You could only drive up to the workshops. And from there I had to walk, by foot, to the place where the well was supposed to be dug, at the southern edge of Kiryat Khayim. This was after working in the orchards, and doing all kinds of other odd jobs, that I decided to start working here. Me and two other workers dug a hole down to the ground water. The ground water was no more than three meters down, maybe even a little less. 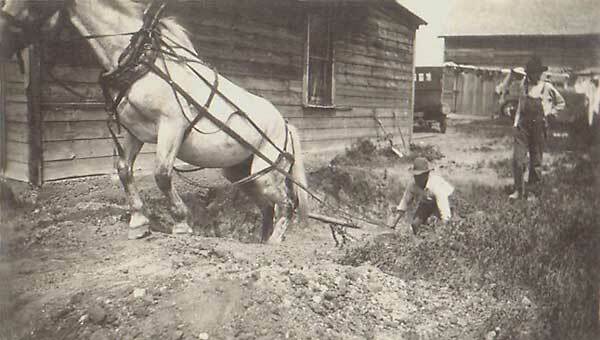 Back then they used horizontal pumps, so that you couldn’t pump more than nine meters deep. In order to make use of all the water in the well, we had to bring the pump as close as possible to the water level. So we dug up to the water level, and reached a depth where it started getting wet. Then we lay down some gravel, some cement, and made a floor, walls, and a little roof. With an opening on top to let in the pipes and the pump, through the roof. And I wrote down some letters to mark the Jewish calendar year, I think it was 5690 or 5691, I’m not really sure, I haven’t been there for decades. It was in 1929 or 1930 at the latest. 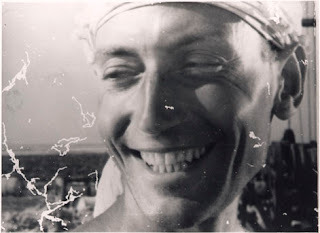 Because I had arrived in Israel on the 6th of August 1929. So it must have been 1930 already. This was my first job. Then, I went to dry out the swamps in Kfar Khasidim. You couldn’t even reach Kfar Khasidim after the rain. There wasn’t even a road to get there – the whole way there was nothing but mud. After the rain, your foot would sink down to your knees. So first I went there with a surveyor, to measure the range for lowering the water down to the River Kishon. And then I drove to Kfar Binyamin, to see one of the Californian farmers. These were six or eight men whom the Baron [Rothchild] had sent to California to learn farming. And they came back and settled in Binyamina, in the first street after the end of Zikhron Ya’akov. One of them had a mule and a Fresno scraper. So I came to see him, and brought him back with me to Kfar Khasidim. So there, with the mules and the scraper, according to the pegs I had placed in the ground earlier with the surveyor, I directed them, and they dug and dug, with their little scraper, until they had managed to dig all the way to the Kishon. When we reached the Kishon, we had to build water channels, so that the water, flowing down, wouldn’t cut too deeply into the earth and block the river. So we built strong, wide water channels out of concrete. This job I did with the members of the Kibbutz Yagur. They were the contractors for this job. It was in 1930. Nu, afterwards I saw that the question of water was a very serious one, and I dedicated myself to it. I worked in Genigar, first in water drilling. Meaning, not with machinery, but with my hands: a rig, three legs, and a kind of a bit: a huge wooden beam about 7 meters long. Slowly, slowly they started bringing equipment from Germany [see Ha’avara]. When Jews arrived from Germany, one of them brought a machine with him. I myself built a rig for it. 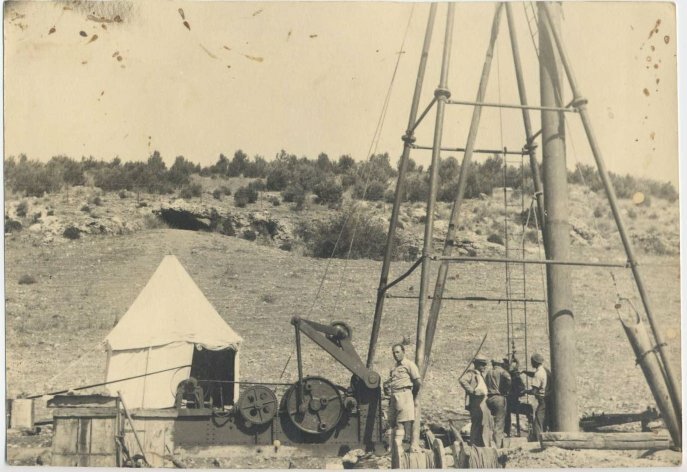 Lova with team drilling a water well, December 16th, 1941. Lova probably closest to the tall pole. So I started drilling with a machine. We used the motor of a tractor, which stood there and moved the bit up and down. And so on and so forth. The early jobs were mostly in the valley – the Izrael Valley. In Nahalal, and Gdeyra, and Genigar, and Mizrah, and Tel Adashim. Also in Kfar Gil’adi, or rather, Kfar Gid’on. In Merkhavia. In the whole valley, everywhere. In the Beyt-She’an Valley too. And then I kept working for the “Mif’aley Mayim” company. They merged with Mekoroth, and formed a bigger company. I was the head of the drilling department with heavy machinery, until I retired. So, what else should I tell you about, what do you want to hear? My cousin: What? About working conditions when drilling. How long it took to drill. How many people worked together. So I rented a room for the first time, along with a third of a kitchen, since it was in a flat. 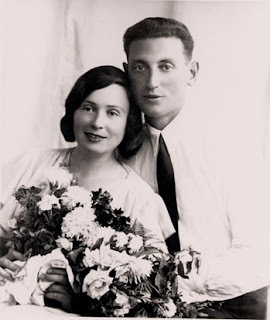 Lova: In 1933, in Haifa. I rented a room in a flat, and there was this old baleboste [Yiddish for housekeeper, landlady], and another couple living in a second room, and we lived in the third one. And that’s it. My cousin: How often would you come home? Lova: Oh, it depended on the distance. Just after I got married, I worked on Mount Carmel. In Eyn-Shi’akh. Not on Mount Carmel, but in a wadi [Arabic for a stream that is dry most of the year] that flows down from Mount Carmel, just like that. About ten or twelve kilometers south of Haifa.